One thing we always have loads of is cardboard tubes, mainly from TP Rolls and kitchens rolls! 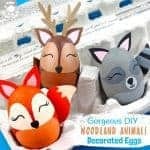 I love to get the kids crafting with them when I can. 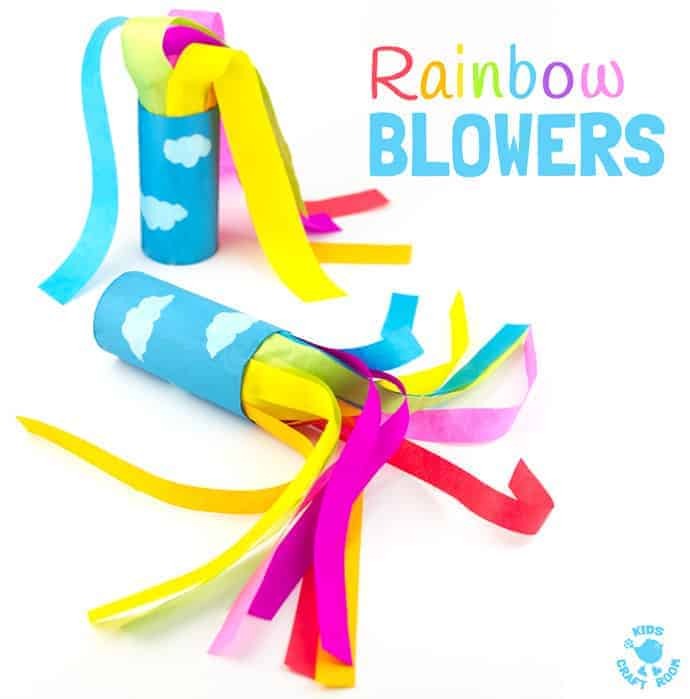 These Cardboard Tube Rainbow Blowers are a wonderful way to recycle them into something colourful and most importantly fun! 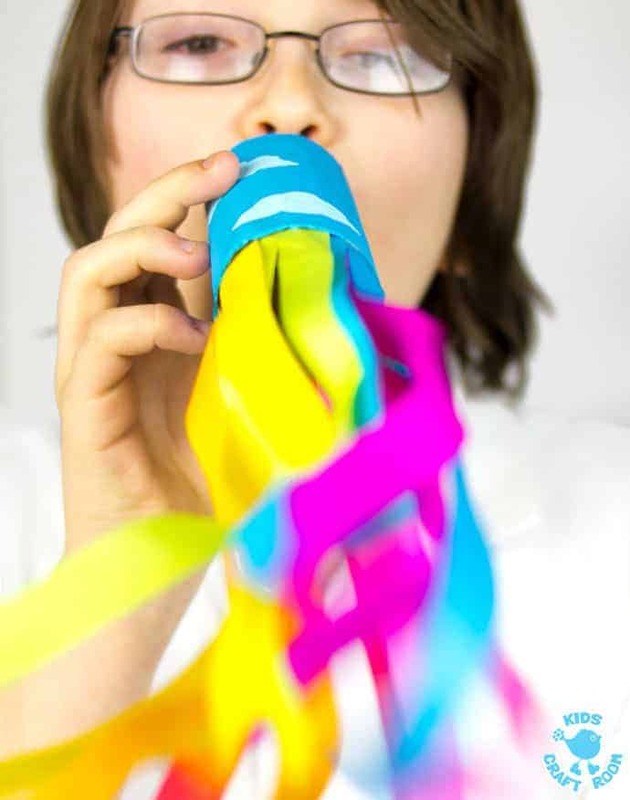 Kids will love to huff and puff down their rainbow blowers and see all the colourful streamers blow and billow about. 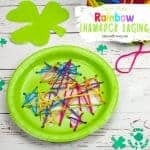 It’s a fabulous rainbow craft to go along with weather learning themes and songs, and as a St Patrick’s Day craft too. 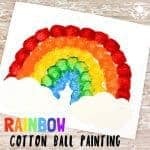 I adore that these rainbow blowers look wonderful hanging up too and double up as pretty windsocks when the kids have had enough of playing with them! 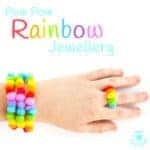 Two rainbow crafts for the price of one LOL! 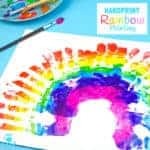 Before you zoom on to see how to make these rainbow blowers, why not share some other fun rainbow crafts to Facebook or Pinterest? It’s a great way to find them again easily and you can give your friends an idea or two too! 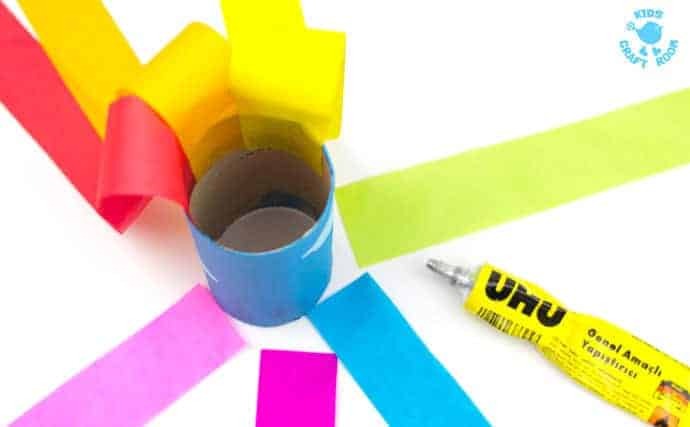 Let’s get back to making those pretty cardboard tube rainbow blowers! Grab your TP rolls and join me below. 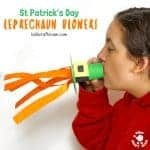 These cardboard tube rainbow blowers are super easy to make and can be done in any colours to match a particular theme. 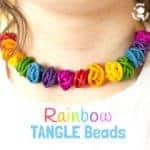 We’ve made ours with gorgeous rainbow colours because St Patrick’s Day is looming but they’d look equally good in gold and greens as a Paddy’s Day craft or how about purples and blacks for Halloween or reds, oranges and yellows for Fall? 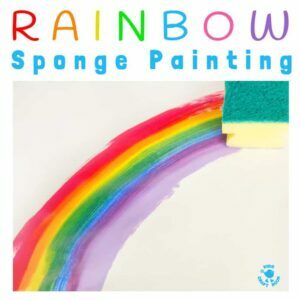 We started our rainbow blowers by painting the cardboard tubes blue. 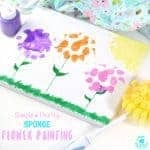 I tend to use acrylic paint because it gives such a good coverage and the kids don’t have to wait around waiting for a multiple layers of paint to dry. 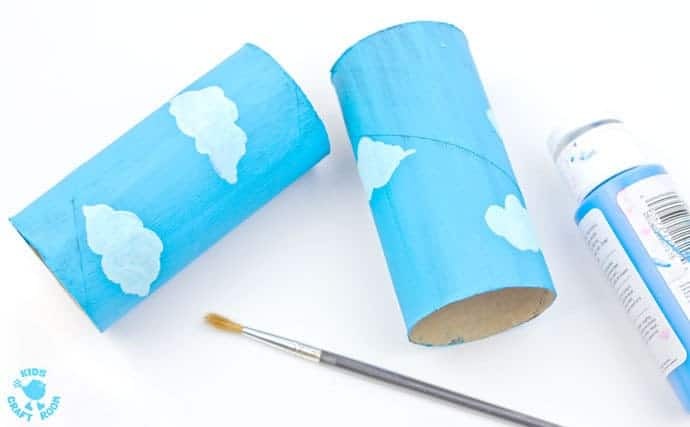 When our blue paint was dry we painted on some light blue/white clouds to add to our weather theme. 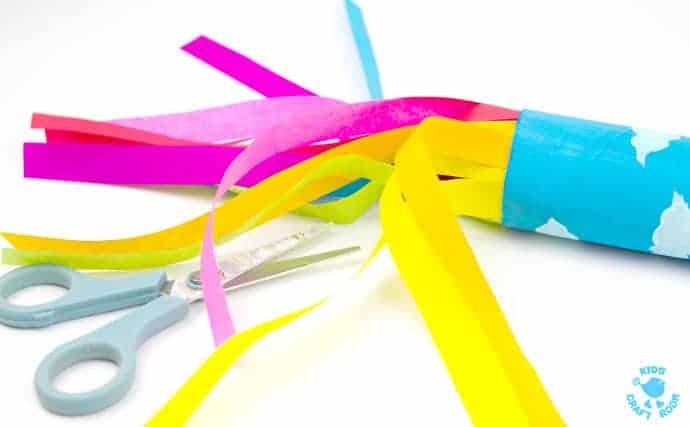 To make the gorgeous rainbow streamers we cut strips of colourful tissue paper. Our strips were about 1 x 12 inches. Don’t worry if you don’t have any UHU or feel your kids are too young for it. Twist up glue sticks or PVA will work just as well just take a little longer to dry. With a slight overlap we were able to get all out 7 rainbow colours glued inside the cardboard tube. 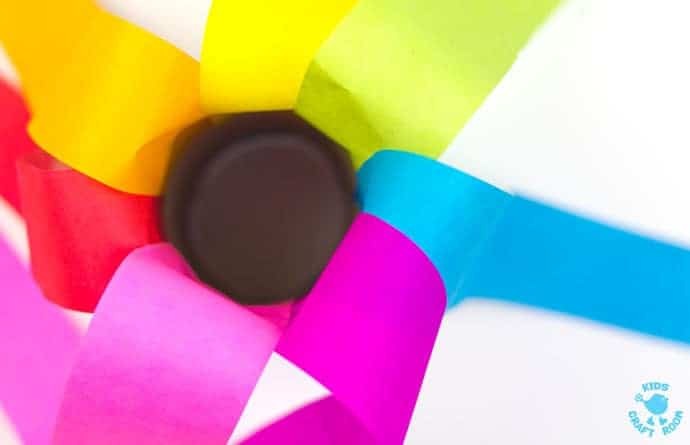 On one of our rainbow blowers we cut each tissue paper streamer in half lengthways. 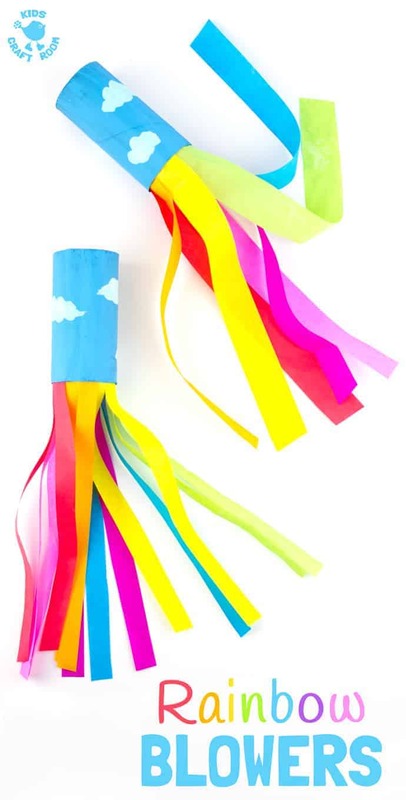 It made each individual streamer lighter and easier to blow. 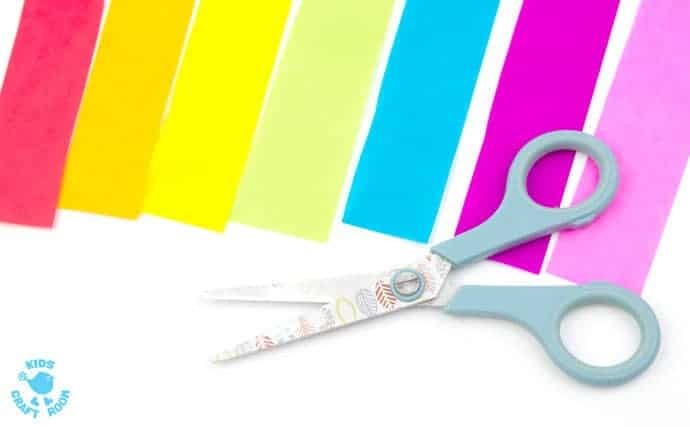 Whether you leave the rainbow streamers fat or cut them thinner is up to you. They look super pretty don’t they? 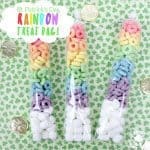 And are so much fun to blow and send the rainbow colours swooshing! 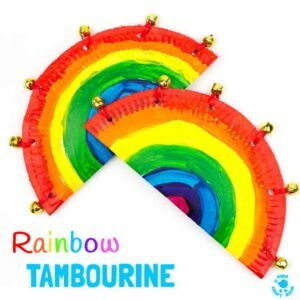 If you want to you could use string them up and use them as rainbow wind socks too, what fun! 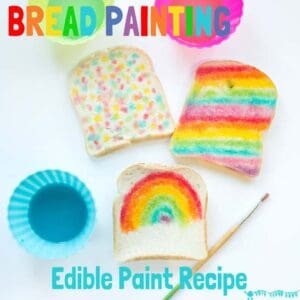 Will your kids enjoy this colourful rainbow craft too? I love hearing how you get on. Leave a comment below, come and chat on Facebook or sign up to our email updates. Did anybody try this? We painted, cut, glued, cut. 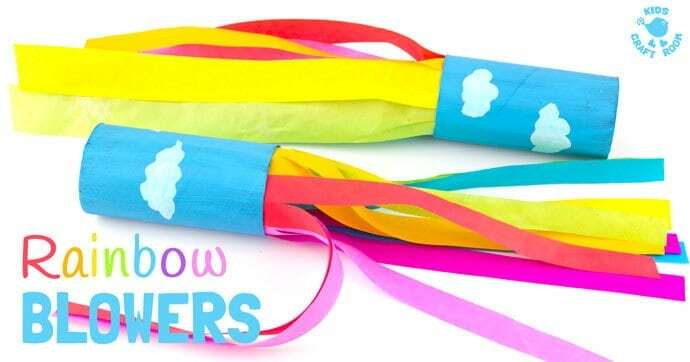 Blew— streamers barely moved. Did I do something wrong? Had fun making but disappointed in finished product. Oh Dawn I am so sorry to hear that, ours work so well! I wonder if your tissue paper is a heavier weight/better quality than ours? If your kids are small and don’t have as much puff it may be worth experimenting with a narrower and shorter tube and thinner pieces of tissue. I really hope that helps because we’ve had so much fun with ours. 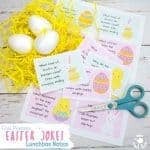 These look so easy to do but then so effective! Must try them! Thank you, sometimes simple is the best!